US Supreme Court Hands Donald Trump Muslim Travel Ban One of His Biggest Victories – Coercion Code – "Dark Times are upon us"
The US Supreme Court has handed Donald Trump one of the biggest victories of his presidency, upholding his travel ban targeting several Muslim-majority countries and rejecting the idea it represented unconstitutional religious discrimination. The 5-4 ruling, with the court’s five conservatives in the majority, ends a fierce fight in the courts over whether the policy represented an unlawful Muslim ban. The court held that the challengers had failed to show that the ban violates either US immigration law or the US constitution’s First Amendment prohibition on the government favouring one religion over another. Mr Trump can now claim vindication after lower courts blocked his travel ban announced in September, as well as two prior versions, in legal challenges brought by the state of Hawaii and others. Mr Trump followed up with a statement at the White House, claiming the decision was “a moment of profound vindication” for his policy. “Today’s Supreme Court ruling is a tremendous victory for the American people and the Constitution,” he said. In his remarks at the White House, Mr Trump reinforced his reasoning for the ban. “We have to be tough, and we have to be safe, and we have to be secure. At a minimum, we have to make sure that we vet people coming into the country,” the Republican president said. “We express no view on the soundness of the policy,” Justice Roberts added. The ruling affirmed broad presidential discretion over who is allowed to enter the United States. It means that the current ban can remain in effect and that Mr Trump could potentially add more countries. Mr Trump has said the policy is needed to protect the country against attacks by Islamic militants. The current ban, announced in September, prohibits entry into the United States of most people from Iran, Libya, Somalia, Syria and Yemen. Justice Roberts said the actions taken by Mr Trump to suspend entry of certain classes of people were “well within executive authority and could have been taken by any other president — the only question is evaluating the actions of this particular president in promulgating an otherwise valid proclamation”. But rights groups have denounced the decision. 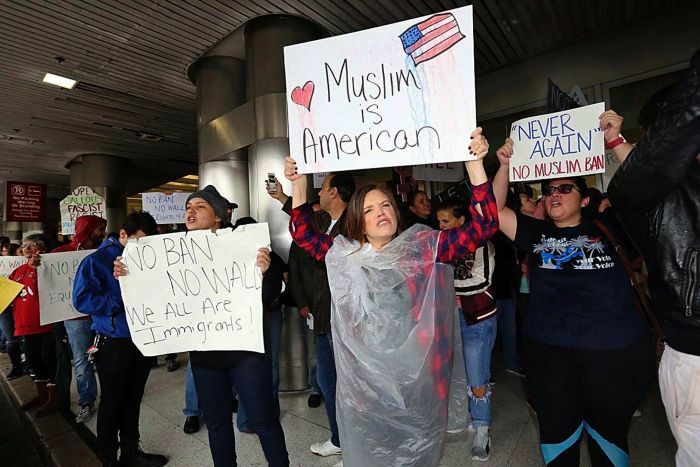 “The ruling will go down in history as one of the Supreme Court’s great failures,” said Omar Jadwat, a lawyer for the American Civil Liberties Union, which challenged the ban. The court’s decision “swallows wholesale government lawyers’ flimsy national security excuse for the ban instead of taking seriously the president’s own explanation for his actions,” Mr Jadwat added. “Not since key decisions on slavery, segregation in schools, and Japanese American incarceration have we seen a decision that so clearly fails to protect those most vulnerable to government-led discrimination,” added Farhana Khera, executive director of the group Muslim Advocates. In dissent, liberal Justice Sonia Sotomayor said there were “stark parallels” with the court’s now discredited 1944 decision that upheld US internment of Japanese-Americans during World War II. Justice Sotomayor described at length various statements Mr Trump made on the campaign trail. “Taking all the evidence together, a reasonable observer would conclude that the proclamation was driven primarily by anti-Muslim animus,” the judge added. 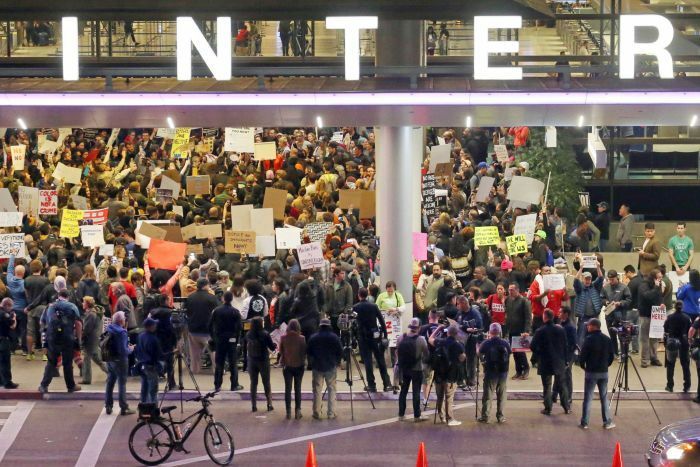 The travel ban was one of Mr Trump’s signature hardline immigration policies that have been a central part of his presidency and “America first” approach. Mr Trump issued his first version just a week after taking office, though it was quickly halted by the courts. Chad initially was on the list of countries targeted by Mr Trump that was announced in September, but he removed it on April 10. Iraq and Sudan were on earlier versions of the ban. Venezuela and North Korea also were targeted in the current policy. Those restrictions were not challenged in court.